At Sarkisian's, not only have we learned how rugs are produced, but also learned the care needed to assure they last a lifetime and more. We are one of the few businesses in Colorado that hand washes fine Oriental rugs with soap and water to ensure they are not damaged in the cleaning process. 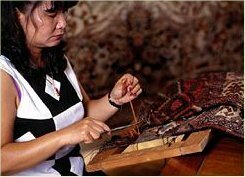 Because of our reputation of excellence in rug care, rugs are sent to us from all over the world for cleaning and restoration. Schedule Your Rug Cleaning Today!! Call 303-893-2583 or 303-733-2623 to schedule a pickup of your rugs for cleaning, or feel free to drop off your rugs at the location most convenient to you during business hours: Tuesday-Saturday, 10:00am-5:00pm. At Sarkisian's in Denver, we have some of the most experienced rug repair experts in Colorado. Our weavers can repair anything on your rug or carpet, including a simple spot tear, side wrapping, overcasting, fringe repair, as well as completely reweaving holes and complete areas of a rug, large or small. Our repair and restoration techniques are top notch, our weavers can handle any restoration challenge.